The short answer: I am against it. Lest I be accused of bias, that goes for every book - not just the ones that result in a couple of bucks landing in my pocket. I was surprised recently when asked via email what my attitude was towards piracy of my book, and if an online donation might work as a "last resort" way for pirates to show their appreciation for my work. For the record, I am a big supporter of making my book available in as many formats as possible. That's why I'm impressed that Wrox books are now available on Kindle, Google Books, Safari, and PDF eBooks. I get a royalty no-matter where you buy it from, so if you want a copy pick wherever offers the cheapest price for the format you prefer. I'm also against DRM - I believe that DRM does nothing to prevent piracy while annoying the folks who legitimately paid for the content - so I was also thrilled with Wrox's decision to make their eBooks DRM free. Your book is expensive: Do you have a donate link anywhere to show my appreciation but save a few bucks? I can't speak for anyone else, but I don't write my books for the money. The advance and royalties go some way to compensating for the significant time and effort it takes to get the books written - but for me at least, it's not going to make me rich or let me give up my day job. More importantly I don't write in a vacuum. Books cost money to make. I'm not talking about the paper, printing, and transport costs, I'm talking about all the people who were involved in making my book the best it could be. There are 17 people on the "Credits" page for Professional Android 2 Application Development. They are not vanity credits. As an example, the following folks are the ones on that list who I had direct, repeated email contact with over the course of writing the book. Apologies to those I left out - they are equally important to the process. Scott Meyers (Acquisitions Editor) suggested I write a second edition and shepherded it through the process. William Bridges (Project Editor) made sure I handed in chapters on something resembling a schedule (without him I'd still be working on the 1st edition), as well as dispensing invaluable advice on everything from book and chapter structure to clarity and semi-colon use. Milan Shah (Technical Editor) reduced the number of bugs in my code. Sadie Kleinman (Copy Editor) corrected my comma use, spelling errors, grammatical issues, and generally ensured I didn't embarrass myself. Mary Beth Wakefield (Editorial Manager) kept it all together when things got chaotic. Kyle Schlesinger (Proofreader) ensured nothing slipped past us during the many edits and revisions before it went to print. Michael Trent (Cover Designer) gave us the awesome Terminator cover (image by Linda Bucklin). Robert Swanson (Indexer) provided a way to find things without a photographic memory. David Mayhew (Marketing) made sure it was available from wherever people wanted to buy it. These folks are an absolutely essential part of the writing process, and they don't work for free. Nor should they. There is a really simple way to show your appreciation for all the people involved in writing a book. Buy it. Sure, but I need to know what the book teaches for my job / class, but I don't have the money to buy it. Many people find the structured, consistent, and guided form of a book to be a great way to learn new material. Others find books a more useful reference while working. If you're one of those people, and you want to be able to continue using books in such a way, buying them is the only way to help ensure that will happen. What are your thoughts on 2nd hand books and libraries? Bring them on! I've probably bought 1,000 books in my life - of which more than half are 2nd hand, and I've probably borrowed a few hundred from libraries too. Electronic books introduce new challenges to the 2nd hand book market and libraries. I'm firmly on the side that says that the rights we have with paper books should be mirrored in the electronic publishing age. If you're done with a book you should be able to sell it, loan it, or give it away without restriction. If everyone downloads pirated PDFs of books instead of buying them, publishers will stop publishing them. Without a publisher many books won't get written or released. I don't have the time, money, skills, or inclination necessary to produce a book of sufficient quality on my own. I need the 17 people on the credits page (and several more besides) to publish each new book or revision. Writing isn't my livelihood, so as an author the end of publishing would be a serious disappointment, but I'd just stop writing and get on with my day job. As a reader? I can barely imagine a future so grim. Just buy the book people reading this....superb book! I'm definitely with you in all points you brought forward but I think you left one serious out. Pricing of eBooks! For example if I follow the links from your site the eBook is actually more expensive than the printed one. I believe that many people feel that it should not be the case. By buying eBooks you should be able to save cost of printing, materials and shipping. I believe that piracy could be greatly reduced by making eBook pricing reflect that! Anyways, your book is excellent. Do you have any plans updating it to Android 3.0+? Agreed... Buy the book. A donation doesn't justify your piracy just makes you feel a little less guilty about it. If someone thinks the book is truly worth it and they don't 'have the money', then they should make some sacrifice in order to obtain it. I've sold away game consoles and clothes (that I still liked wearing!) to be able to afford other things that I needed like books, classes, hell even gas. I bought the book but really would liketo have it in electronic form. They should. sell them as a pair. I certainly don't want to pay twice . I personally believe the price for books are relatively cheap and it should be possible to buy them at least for people working in the IT business. I also like to highlight important bits in book therefore I'm a big fan in buying books. Also I believe that if the author (in this case Reto) decides that his content should be published within book form this should be respected. As Reto pointed out therefore are lots of free online resources for learning Android. I bought my printed copy from amazon.com and I'm very satisfied with it. Greatest book on android available. Piracy sux. That's it. And its cheap too, compared to what computer literature costed a couple of years ago. I for instance bought a borland delphi book for about 80£, and i did not even passed the third chapter since i the understood that pascal wont give me any jobs. 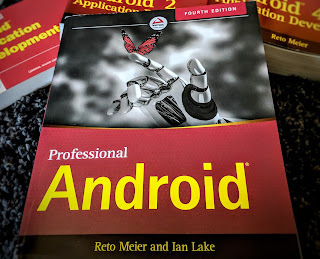 This book on the other hand gave me all i needed to get pass a lot of challenges with android application programming, thanks to reto.